I don’t know about you, but I’m ready for salad this weekend! Don’t get me wrong, I love the Thanksgiving feast. Love it a bit too much, perhaps. After lots of turkey, mounds of potatoes and all the tasty apps, a good salad is in order. 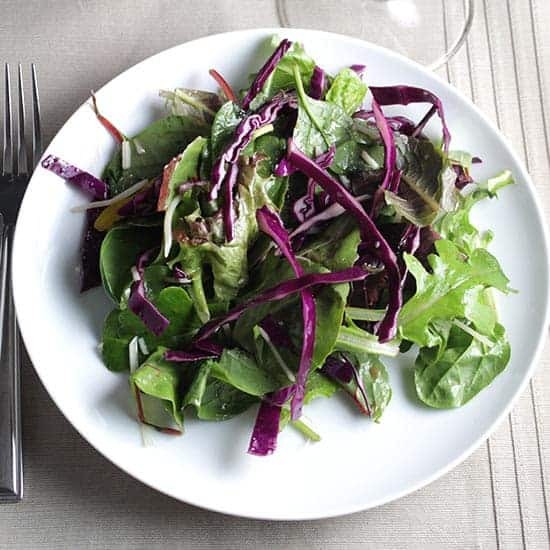 I’ve had this Smoky Maple Greens and Cabbage Salad in queue for quite awhile now. The Smoky Maple Dressing in it is a huge hit in my family now. I first made it after meeting the producers of the Sugar Bob’s Finest Kind Smoked Maple Syrup at a Mass Innovation Night event this summer. 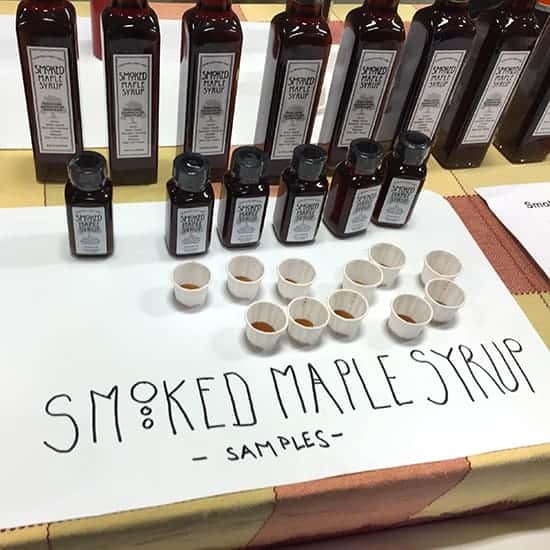 If you haven’t tried smoked maple syrup, you should definitely check it out. It’s made from 100% pure maple syrup infused with hardwood smoke. You can order some or find out where you can buy it on Sugar Bob’s website. Since picking up a bottle of this syrup, I’ve been tweaking the Smoky Maple Dressing to get the proportions just right. Two days after Thanksgiving, it’s time to go public with this delicious dressing! 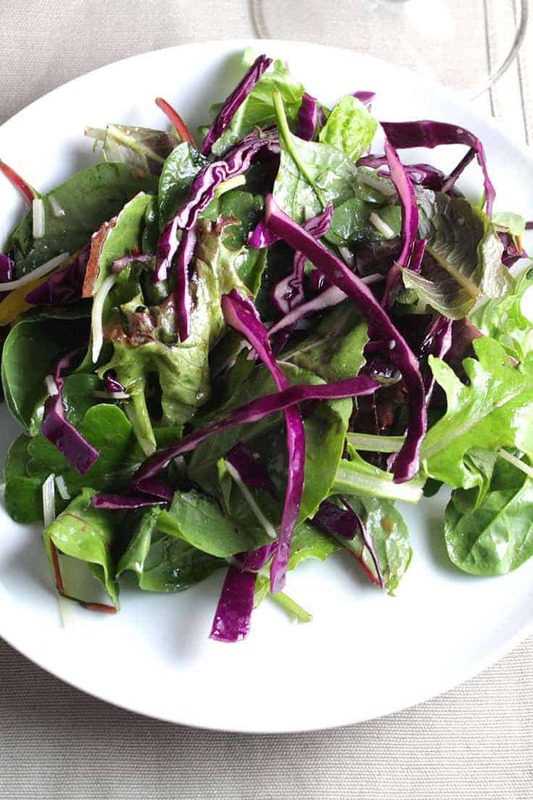 The Smoky Maple Dressing is particularly good on a salad with cabbage in it. When you crunch into the salad, you get a nice combo of smoky sweetness. The feta gives it a touch of saltiness, so you’ve got all the flavors going on in this salad. I brought this to a dinner with my extended family the other night. They are quite familiar with my standard salads, and often request that I bring it to dinner. As they crunched into this greens and cabbage salad, I got a lot “wows!” followed by, “did you make this recipe up yourself?” Though I’ve been food blogging and creating my own recipes for years now, lots of people seem to think a recipe that tastes awesome like this salad must have been created by some famous celebrity chef or something. Wrong! (unless having a food blog makes you a celebrity). So, filled up with turkey and potatoes? 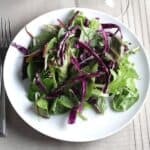 Do yourself a favor and make this Smoky Maple Greens and Cabbage Salad! 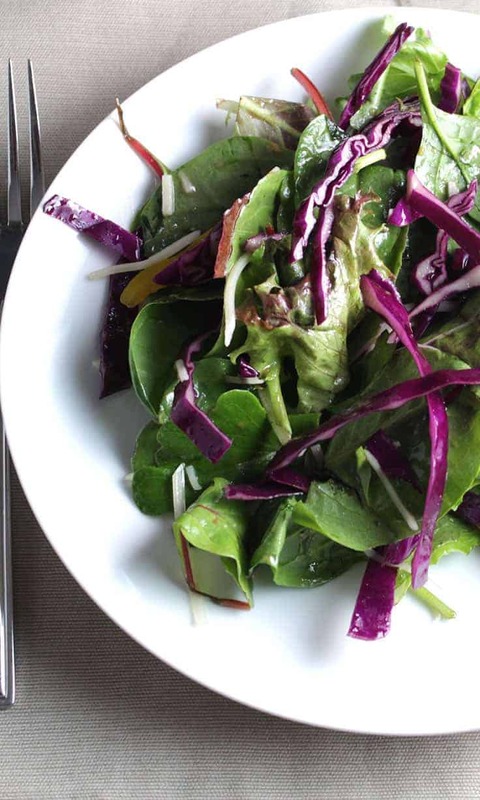 Mixed greens and cabbage tossed with a delicious smoky maple dressing. Make the dressing: combine both types of maple syrup and the olive oil in the bowl. Add the cider vinegar, then whisk in the mustard. Add the sage, salt and pepper to taste. Stir again, and set the dressing aside. Place the salad greens in a large salad bowl. Add the cabbage. Add the bell pepper to the salad, followed by the feta. 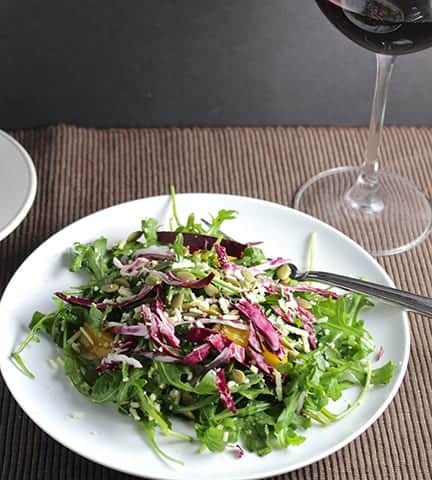 Add 3 tablespoons of the dressing all around the salad, then use salad tongs to toss well, and have the dressing thoroughly distributed and coating all the greens. You can add a bit more of the dressing if needed, or offer it at the table for people to take more for themselves. Plate the salad, and top each serving with a sprinkling of the pumpkin seeds. Want another salad idea? This Tuscan Arugula Salad is also delicious!